If you’ve read my blog for any period of time you’ll know that I “suffer from” depression and I have anxiety disorder. Usually this is kept in check by living as stress-free as can be and living a fairly healthy and positive lifestyle. Sometimes, just sometimes I slip; shizzle happens, life takes a detour and I end up camping in anxiety town for a little while. Well hello there anxiety town! It’s been a while, but I’m back. It’s pretty cold and grim here too. I don’t really know what’s caused it. A few personal knocks and positive lifestyle slips I reckon. Either way it’s not cool and I need to pull myself together before I end up signing a lease for a flat in crazy town. I’ve lived there before, again I repeat, it’s not cool. I went out for dinner with friends the other night, we’d necked a decent amount of red wine between us. (Anxiety red flag number one, drinkies. Keep ’em coming, cheers!) I got home and flopped on the sofa, my foot was itchy so I started scratching it. I have psoriasis on my feet but they’d been pretty good lately, (watch out for anxiety flag number two) within minutes I’d basically scratched all the skin off the sole of my foot and it was a bloody mess, but it felt good so I carried on scratching until my hand was covered in blood and I had to bandage my foot to stop it bleeding everywhere. I went to bed and slept like the dead. It was probably the red wine. With anxiety I either sleep all the time or not at all, and I twitch like a 1980s body-popper. It’s so annoying, but at least I slept. I woke up, did some work and went off to playgroup. Notice anything missing there? Breakfast maybe? Yup, I’m back on the anxiety diet. It’s super-cool and helps me drop pounds! Though I won’t be writing a best selling diet book anytime soon. My Anxiety Diet™ consists of not eating at all, or if pushed I’ll have a bowl of Rice Krispies. I’ll exist on diet coke, but don’t worry, because my anxiety really ramps itself up so I’ll be adding fingernails to my diet. All the major anxiety food groups covered there – cereals fortified with vitamins and iron, a caffeine based drink and fingernails. Diet sorted. It’s annoying to be back here again, but I guess the anxiety that started last year wasn’t a passing phase after all. I guess it’s here to stay and I just have to learn how to manage it on my terms. The annoying thing is I quite like some aspects of my anxiety symptoms. I love the diet which works wonders and saves a fortune. Rationally I know it’s terrible for me, but I enjoy the self control and the hunger pains. Even if it’s just for a couple of weeks. I know it’s not healthy. 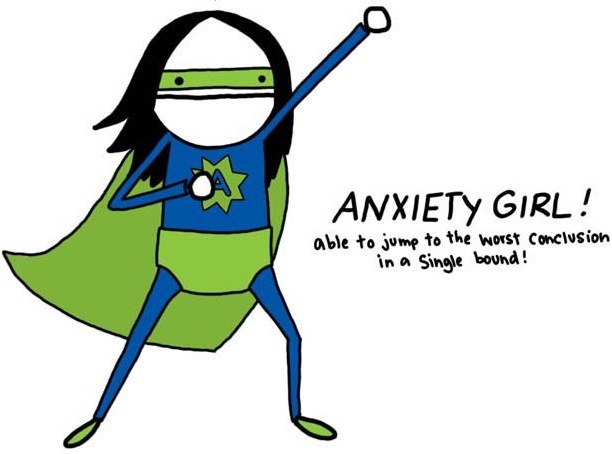 I know a lot of my anxiety behaviour isn’t healthy. Throw yourself into family life, extra cuddles and park visits for the boy. Throw yourself into work. Get cracking and clear that backlog. Throw yourself into a swimming pool. Carry on with healthy exercise. Be with people who love and appreciate me. And lastly…find and deal with or eliminate the causes of my anxiety. This entry was posted in Mental Health and tagged anxiety, anxiety disorder, depession, Mental health, stress, wellbeing. Bookmark the permalink. Oh you have my sympathies. I take a stroll down anxiety town every now and then and hate every minute of it. (loving the analogy by the way) your plan sounds good, keeping busy is one of my strategies, as is telling myself that the feeling will pass. Sending hugs.